Jeison Orlando Rodriguez, of Venezuela, holds the Guinness World Record for the man with the largest feet. CHICAGO -- Guinness World Records 2016 is now on sale. The man with the world's largest feet and the world's tallest married couple are some of the amazing people featured in the latest edition of the record book. The man with the world's largest feet and the world's tallest married couple are some of the amazing people featured in the latest edition of Guinness World Records. Jeison Orlando Rodriguez, 20, of Venezuela, holds the record for the biggest feet in the world. Guinness said his feet are nearly 1 ft. 4 in. long. That's a size 26 shoe. Looking for the world's largest hot dog cart? Head to Union, Missouri. Guinness said Marcus "Hot Dog Man" Daily, 44, built the cart. It's 12 ft. tall, 9 ft. wide and 23 ft. long. The cart has a drive through, a bathroom and serves up to 300 people every day. 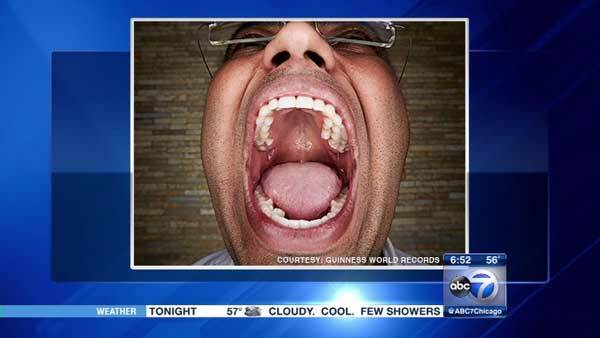 A 27-year-old man from India holds the record for the most teeth. Vijay Kumar has 37 teeth in his mouth, Guinness said. That's five more than is usually found in the average human mouth. He said sometimes they hurt and he bites his tongue a lot. But he also said it's worth it to get into the record book. The tallest married couple in the world hails from China, according to Guinness. Sun Mingming, 33, stands at 7 ft. 8 in. His wife, 29-year-old Xu Yan, is 6 ft. 1 in. tall.